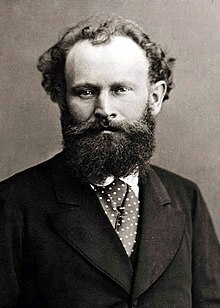 Édouard Manet (French: [edwaʁ manɛ]; 23 Januar 1832 – 30 Aprile 1883) wis a French penter. He wis ane o the first 19t-century airtists tae pent modren life, an a pivotal feegur in the transeetion frae Realism tae Impressionism. Born intae an upper-cless hoosehaud wi strang poleetical connections, Manet rejectit the futur oreeginally enveesioned for him, an becam engrossed in the warld o pentin. His early masterwarks, The Luncheon on the Gress (Le déjeuner sur l'herbe) an Olympia, baith 1863, caused great controversy an served as rallyin pynts for the young penters that wad creaut Impressionism. The day, thir are conseedert wattershed pentins that merk the stairt o modren airt. The last 20 years o Manet's life saw him form bonds wi ither great airtists o the time, an develop his awn style that wad be heraldit as innovative an serve as a major influence for futur penters. This page wis last eeditit on 6 November 2018, at 03:38.